2. SHARE THIS POST ON YOUR OWN WALL LINKING TO THIS PAGE. 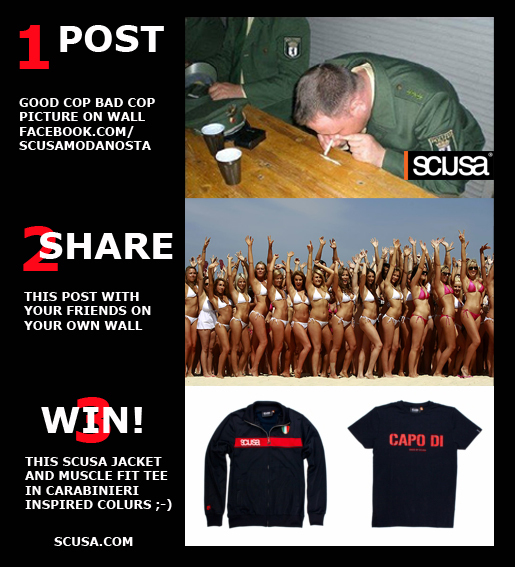 NOTE:"POST AS MANY ENTRIES AS YOU LIKE, ONLY ONE ENTRY WILL WIN THE "CALCIO ITALIA TRACK JACKET" OF € 59,99 PLUS "CAPO DI TUTTI CAPI" MUSCLE FIT TEE-SHIRT OF € 34,99 - MADE BY SCUSA - IN COLOURS INSPIRED BY OUR FRIENDS OF THE ITALIAN CARABINIERI. SCUSA MODA NOSTRA - ORGANIZED FASHION - MADE BY SCUSA - CAPISCE!